When Maponya Attorneys signed a memorandum of understanding with the North-West University’s (NWU’s) Faculty of Law a few months ago, little did anyone anticipate the exponential growth this partnership would produce. Within two months, five first-year law students were benefiting from a R250 000 grant from this top law firm. “In addition, Maponya Attorneys founder Mr Phathudi Maponya pledged an additional R100 000 for the legal education of two more students,” says Christopher Motabogi, communication manager on the NWU’s campus in Mahikeng. “It’s an excellent example of how strategic partnerships with private sector companies can contribute to the South African government’s priority of challenging the scourge of unemployment, particularly among the youth,” he adds. 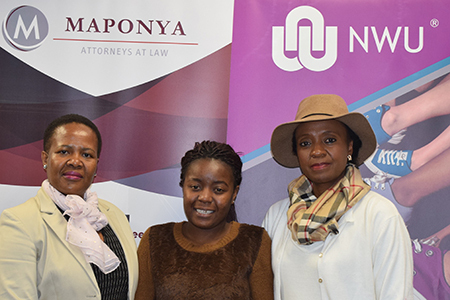 Maponya Attorneys recently showed their commitment again, this time by donating a laptop to Ms Dorka Ndhlovu, a second-year LLB student. She’s the third of five children and hails from a struggling family from Khuma in Klerksdorp. “To me this (laptop) is not just a gift. I’m very grateful. It will have a positive impact on my studies,” says Dorka. She recently also started working weekends at Mahikeng’s Sky Cinema thanks to Maponya Attorneys. “This work arrangement will not only ensure that she earns extra money, but will enable her to experience the satisfaction of earning her own income instead of only receiving,” says Dr Neo Morei, the deputy dean for quality assurance and stakeholder relations at the faculty. Ms Kholofelo Seabi, a director at Maponya Attorneys’ Mahikeng office, congratulated Dorka on behalf of the firm. Ms Seabi announced that shortlisting was underway to provide two (preferably) final-year law students the opportunity to take part in a three-week-long Winter Vacation Internship Programme at Maponya Attorneys. Meanwhile, the NWU is also continuously involved in various initiatives, which include appealing to alumni and other stakeholders to make donations to lessen the plight of needy students through the provision of meals and payment of fees for academically deserving students. Dorka Ndhlovu, a second-year NWU law student (centre), says the laptop will assist with her studies and research. With her (on the left) are Ms Kholofelo Seabi, a director at Maponya Attorneys, and Dr Neo Morei, deputy dean for quality assurance and stakeholder relations at the faculty.